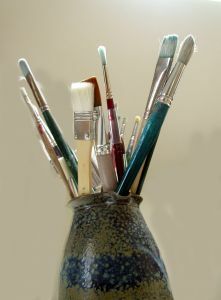 Paintbrushes are important for many artists. I have jars & jars of them for all purposes. Foam brushes are useful in almost every kind of art I create. Stores such as Michaels, A. C. Moore, and Hobby Lobby often feature foam brushes on sale. For example, from 16 – 22 January 2011, Michaels were selling 14 foam brushes for $1. Two more notes: I generally get at least three to five uses from each foam brush. I wash them thoroughly and promptly after using them.